Awarded the degree of Doctor of Philosophy (Ph.D.) by the University of Southampton. Dissertation supervised by Michael Finnissy. Musicological research (Ph.D.) with Dieter Torkewitz at the Vienna University of Music and Performing Arts. Composition studies with Adriana Hölszky at the Mozarteum University of Salzburg. Graduation: Master of Arts “with Distinction”. Attended the composition masterclass of Klaus Huber at the University of Music in Basel. with Helmut Lachenmann and Georges Aperghis at the Darmstädter Ferienkurse. Studies at the Mozarteum University of Salzburg: Composition and Music Theory (electronic music and audiovisual media); Music Education (interdisciplinary music pedagogy and music philosophy, composition with Bogusław Schaeffer); Classical Guitar Performance. Graduation (thrice): Bachelor of Arts “with Distinction”. Premiere of NAVAL SYMPHONY – I. VARYAG for 250 musicians (Primorye Philharmonic Society, Pacific Symphony Orchestra, et al.) at the central square of Vladivostok – the highlight cultural event of Eastern Economic Forum 2017. 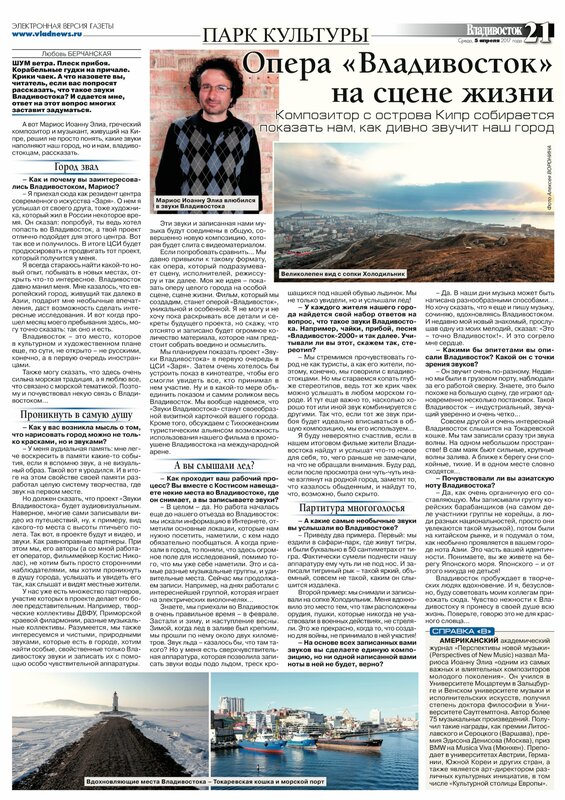 SOUND OF VLADIVOSTOK – an audiovisual portrait of the city for 350 musicians (22 institutions involved). Premiere of IMMERSION for viola da gamba and multimedia at FH-St. Polten. Premiere of PLEORAMA for choir, violin and piano four hands in St. Polten (BORG Music School Vienna), in collaboration with Tokyo Gakugei University. Premiere of TELENAUTEN for speaking choir and hardware ensemble in St. Polten (Open Acting Academy Vienna). Premiere of RUN at Mozarteum Solitaer (Salzburger Gesellschaft für Musik). Composer-in-Residence at ZARYA – Centre for Contemporary Art, Vladivostok. Composer-in-Residence at International Society for Polyaesthetic Education, St. Polten. 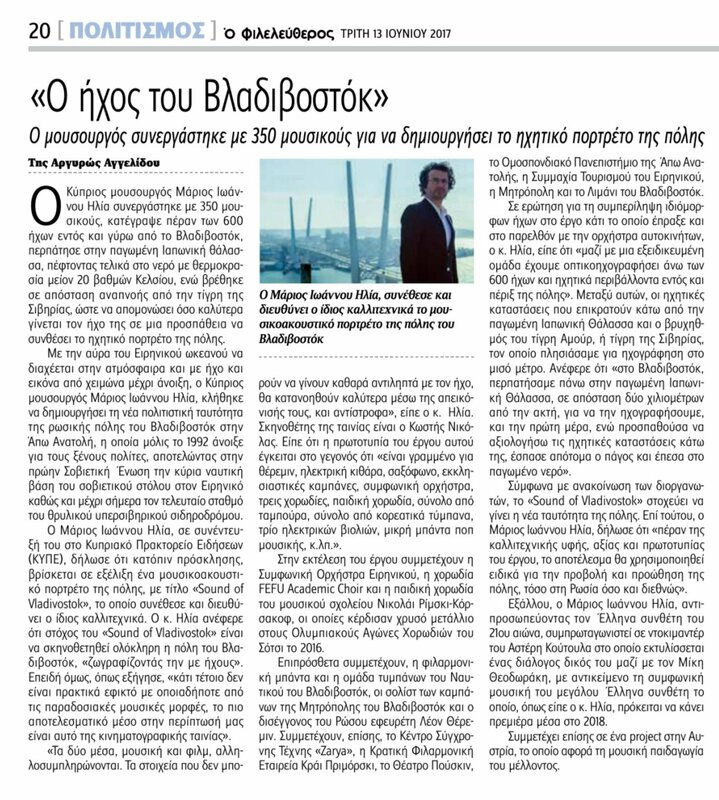 “Talks on Music” with Mikis Theodorakis, Marios Joannou Elia and Lefteris Veniadis, Greek-German documentary film directed by Asteris Kutulas (to be screened 2018). Official author (musicology) of Schott Music, Mainz. Premiere of ABSCHIED (for singers, choir, celli and guitar orchestra) by the Mozarteum University of Salzburg. Composition of SALZ and PFEFFER – to be premiered by Miscelanea Guitar Quartet at Salzburg Guitar Fest 2017. Collaboration with the Muzička Academia Sarajevo / Univerziteta u Istočnom Sarajevo. Bosnia and Herzegovina premiere of ELPIS (in Bosnian) on the occasion of the World Accordion Day at the Bosniak Institute. Composition of the open air oratorio ULMER ORATORIUM for 400 musicians (10 soloists, 2 orchestras, 7 choirs, bell orchestra, machinery orchestra, percussion ensembles, electronics, etc.) for Ulm’s Cathedral Square (commissioned by the City of Ulm for the 125th anniversary of the Ulm Minster Tower). Premiere TBA. Composer-in-Residence at the International String Festival “Passauer Saiten”. Premiere of a new work by Miscelanea Guitar Quartet at the grand opening celebration of Literaturfest Salzburg (Large University Auditorium Salzburg). Production of the music videos STAUBZUCKER, APOPHIS and SOLILOQUY in Salzburg, Vienna, London and Thessaloniki by Aesthis Records. Composer-in-Residence at Akademie Schloss Solitude, Stuttgart. Premiere of the open air multimedia symphony AUTOSYMPHONIC for 290 musicians at Mannheim’s central square, Friedrichsplatz, before an audience of 20,000 people (over 500 journalists from 40 countries, seven TV crews from Asia, the U.S. and Europe, more than 1.5 billion media contacts, 55 million TV viewers): SWR Baden-Baden and Freiburg Symphony Orchestra, SWR Vocal Ensemble Stuttgart, Stuttgart State Opera Children’s Chorus, Popakademie Baden-Württemberg, 120 adolescents from the City of Mannheim (cond. Johannes Harneit, Klaas Stok, Johannes Knecht). Premiere of AUTOTRIO for three automobiles, 14 percussionists and electronics by the Popakademie Baden-Württemberg and National Theatre Mannheim at Rosengarten Mozartsaal in Mannheim. Premiere of the music film AUTOSYMPHONIC (dir. Horst Hamann) at CinemaxX Mannheim. Collaboration with the pop group Söhne Mannheims (Michael Herberger and Xavier Naidoo): Premiere of DER TRAUM for soul singer, rapper, pop band, symphony orchestra and choir at Friedrichsplatz Square, Mannheim (Söhne Mannheims, SWR Baden-Baden and Freiburg Symphony Orchestra, SWR Vocal Ensemble Stuttgart, cond. Johannes Harneit). Creation of the world’s first car orchestra consisting of 80 automobiles (after a ten-month casting of 120 cars all over Germany). Invited to “Louise, Destination Europe” and the exhibition “Very European People” of the Belgian EU Presidency in Brussels. Invited to Skopje Biennale: Premiere of VERTUMNUS for electroacoustic music and interactive shadow play at the Macedonian National Opera and Ballet Theatre (big stage). Premiere of AIRDANCE for an automated electromechanical orchestra by the Absolut Quartet at Ars Electronica FutureLab, Linz. Premiere of AKANTHAI (version for large orchestra) in Saarbrücken (German Radio Philharmonic Orchestra Saarbrücken Kaiserslautern, cond. Johannes Kalitzke). Composer-in-Residence at the Biennial Congress of the International Society for Polyaesthetic Education, in co-operation with Linz 09 – Cultural Capital of Europe and Ars Electronica Center, Linz. Premiere of the opera DIE JAGD by the Stuttgart State Opera in co-production with Theater Rampe, Stuttgart at the showrooms of Schwabengarage AG in Stuttgart. Premiere of ELPIS for accordion septet and percussion duet at Gaudeamus Festival in Amsterdam (Nederlands Accordeon Ensemble, cond. Egbert Spelde) and TESSERA for recorder duet and double bass trio (2004) at Darmstädter Ferienkurse (repet. Uli Fussenegger, Jeremias Schwarzer). Premiere of TEMPUS TANTUM NOSTRUM EST for vocal ensemble and motorbike duet at Salzburg Biennale (Vocal Arts Ensemble Stuttgart, cond. Angelika Luz, Motodrom Harley-Davidson, Salzburg). Invited by Akademie der Künste, Berlin at the “Challenging Walls” Conference in Berlin (International Arts- and Peace-Project). Invited at the Cultural Days of the European Central Bank in Frankfurt. Invited by the Austrian Section of the International Society for Contemporary Music to represent Austria at the World New Music Days in Sweden (EN PLO) and Sydney (TESSERA). Portrait concert at Akademie der Künste, Berlin (introduced by Adriana Hölszky). Composer-in-Residence at Künstlerhaus Lukas in Ahrenshoop (Germany), Schloss Puchberg in Wels (Austria), Visby International Center for Composers (Sweden) and Stiftelsen Kulturhuset USF in Bergen (Norway). Premiere of AKATHAI for chamber orchestra in Frankfurt (Ensemble Modern, dir. Stefan Asbury/Hsiao-Lin Liao). Premiere of STAUBZUCKER at Solitaer Concert Hall (Miscelanea Guitar Quartet) and AQUANAUTEN in the Mirabell Gardens in Salzburg (Drama and Stage Directing Department of the Mozarteum University). Premiere of VERSTECKSPIEL (Ensemble Recherche) and THALATTA, THALATTA! (OENM – Austrian Ensemble for Contemporary Music) at Klangspüren Schwaz. Premiere of EN PLO for contrabass clarinet, double bass, loudspeaker orchestra and electronics at Akademie der Künste, Berlin (Chamber Ensemble New Music Berlin, E-Studio AdK Berlin). Premiere of HYDOR CHRONOS at Salzburg Easter Festival. Premiere of the music theatre DIE REISE DES GUIDO MASTORNA at Salzburg Airport (Amadeus Terminal 2) for the “Mozart Year” 2006. Premiere of SPIEGEL:EYE for large ensemble, loudspeaker ensemble and eletronics at the Hellerau Festival Hall (Dresden Days of Contemporary Music) and HOLY BREAD for string quartet (amplified version) at Konzerthaus Berlin (Ensemble Modern, cond. Titus Engel). Composition of the music theatre DER FLÖTENZAUBERFLÖTE for the Margravial Opera House in Bayreuth for the “Mozart Year” 2006 (Franconia Chamber Opera). Invited to the Offspring Forum of the German Society for Contemporary Music and Ensemble Modern in Frankfurt. Portrait concerts in Salzburg: REFURBISHED (staged concert in six scenes) at Centralkino State Theatre; DAS GEHEIMNIS DES KLEIDERBÜGELS (staged concert in eight scenes) at Toihaus Theatre. Invited to the cultural festival “Kulturjahr der Zehn” of the new EU member states in Berlin. Premiere of DER WEGWEISER at Berlin Philharmonic (Sinfonietta of Leipzig Gewandhaus Orchestra, cond. Johannes Harneit) and SCHWARZE MILCH at Mauthausen Concentration Camp – Commemorative Year (OENM Salzburg). Premiere of the Zeitoper AS TIME GOES BY by the Hanover State Opera at the eight-storey building of the Ministry of Science and Culture of Lower Saxony for the “Einstein Year” 2005. Development of “The Concept of Polymediality” (orig “Polymedialität als Konzept”) and “The Vehicle Cycle” (orig. “Der Fahrzeuge-Zyklus”). Portrait concert BURNING MOTIONS (staged concert in 12 scenes) at the Viennese Hall, Mozarteum Foundation Salzburg. 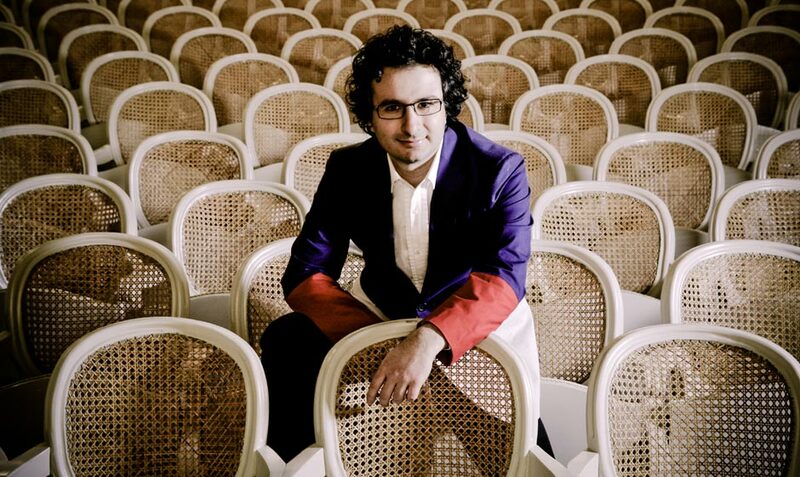 Premiere of STRAWBERRIES AND GRAPES at Chamber Music Festival Basel (Ensemble Phoenix, cond. Jürg Henneberger) and HOLY BREAD for string quartet (violin solo and string trio) at Warsaw Philharmonic (Rubinstein Quartet). Multimedia composition of STROPHES for the foyer of the Volkswagen Transparent Factory in Dresden. Invited to the composition workshop series of Ensemble 11 at the Royal Northern College of Music in Manchester. Invited by the University of Cambridge – New Music Society at Kettle’s Yard: Premiere of WITH A PAIR OF SCISSORS AND THOUSAND THREADS. Premiere of MY EYES, ONLY YOU by the Mozarteum Department of Drama in Salzburg. 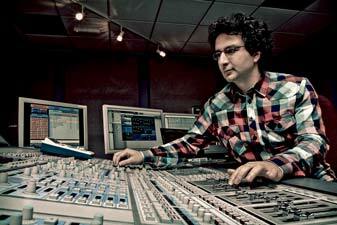 Composer-in-Residence at “New Estonia and Musica Nova Festival” in Gdansk. Invited to the Festival for New Composition and Audio-Art “Avantgarde Tyrol”: Premiere of TRAMP. Realization of interdisciplinary projects for concert halls, theatre houses and public spaces in Austria; in co-operation with artists, scientists and new media specialists – such as the actor Max Simonischek, the writer Simon Werle, the electronic music producer Nick Elia at Abbey Road Studios, London and the Salzburg Institute for Integrative Music Pedagogy and Polyaesthetic Education. Born on June 19 in Pafos, Cyprus. Specifically composed for open air events (around the water tower of Mannheim and the gardens of Mirabell Palace in Salzburg), urban spaces (the Expo Athens, the Salzburg Airport and Collegiate Church, the car showrooms of Schwabengarage in Stuttgart, the modern buildings of Representation of the States of Lower Saxony and Baden-Württemberg in Berlin) and festivities (“Stallwächterparty” in Berlin, ADAC’s annual general assembly in Mannheim, New Year’s Reception of Mannheim’s Mayor). 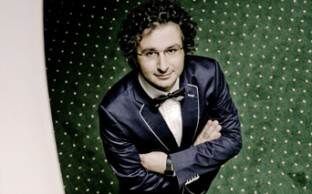 Artistic Director of “Sound of Vladivostok”, Zarya Foundation and Zarya Centre for Contemporary Art, Vladivostok. Artistic Director of the European Capital of Culture – Pafos 2017. Concept: Open Air Factory; Motto: Linking Continents – Bridging Cultures. Budget: 8.5 million Euro. Thematic Categories: Myth and Religion (past), World Travellers (present), Stages of the Future (future). 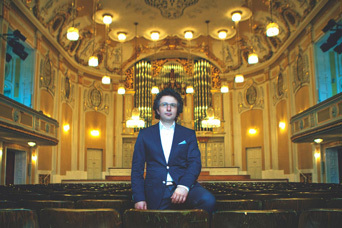 Artistic Director of the production ULMER ORATORIUM in Ulm – with approx. 500 participants. Commissioned by the City of Ulm. Budget: 0.5 million Euro. Thoukidides Think Tank, Cyprus (Education and Culture Committee). Ambassador in Tourism (Republic of Cyprus). Concept: Site-specific cultural and conference tourism focussed on academic/artistic collaborations. Artistic Advisor of “Pafos Aphrodite Festival Cyprus” – International Opera Festival (Festival (Bolshoi Theatre of Moscow, Mariinsky State Theatre of St. Petersburg, Festival of Arena di Verona, National Opera of Poland, etc.). Budget: 0.5 – 1 million Euro per annum. Artistic Director of Aesthis Records, Heidelberg/London. Artistic Director of the production AUTOSYMPHONIC in Mannheim – with approx. 400 participants. Commissioned by m:con Congress Center Rosengarten Mannheim (producer) and the City of Mannheim. Sponsored, among others, by Stadtmarketing Mannheim, MVV Energie AG and Mercedes-Benz. Budget: 2.7 million Euro. Jury member of international composition competitions (e.g. Grammy Awards, Prix Russolo, Hof Klang – Contemporary Music Leipzig in co-operation with the Bach-Archiv, KSG Architects and Urban Planners) and selection procedures (e.g. autosymphonic percussion castings with 270 young competitors). President of “New Works Festival – Celebrating Contemporary Music” in Southampton. Artistic Director of music projects and cultural events produced in Europe (e.g. at Toihaus Theatre Salzburg, Skopje State Opera House, Salzburg Airport). Member of Kulturhauptstadt2024.at – the platform for preparing the European Capital of Culture 2024 in Austria (co-ordinated by the Technical University of Vienna). “The Ruhr area as an Example for the Concept of the European Capital of Culture – Sustainability in Cultural Development. Invited by NRW Kultur International and Goethe Institut. “30 Years of European Capitals of Culture” in Pilsen, Czech Republic. European Capitals of Culture Annual Meetings – Presentations in Kosice 2013 (Slovakia) and Riga 2014 (Latvia). Collaborations with Aarhus 2017 (Denmark), EU-Japan Fest Japan Committee (Tokyo), Erasmus Network for Music “Polifonia”, etc. Aberdeen’s bid to become UK City of Culture 2017 – External Advisor and Designer of the Highlight Event. Budget: 1.5 million Euro. Nicosia’s bid to become European Capital of Culture 2017 – Artistic Programme Consultant and Designer of the Highlight Event. Budget: 1.4 million Euro. St. Polten University of Applied Sciences. Text, Sprache, Figur, Musik – Sound, Instrument, Live – Recording, Licht, Raum, VR & 360 ° = Immersion & Wearable Theatre (in collaboration with Prof. M. Wintersberger). Far Eastern Federal University, Center of Creative and Performing Acts, Vladivostok. Direction of the workshops “Word-Sound-Music” at Salzburg Biennale (together with Dieter Schnebel) and the Department of Music Education at Mozarteum University of Salzburg. Supervision of workshops together with Prof. Udo Dahmen at the University of Popular Music and Music Business Baden-Württemberg. Lecturer at the University of Music and Theatre “Felix Mendelssohn Bartholdy” Leipzig: “Polyaesthetic Education – The Importance of Sound-Scenes and Music Theatre Improvisation” (together with Prof. Michaela Schwarzbauer). Lecturer at SangMyung University in Seoul (composition seminar). Artistic and Research Fellow at the Mozarteum University of Salzburg – Department of Composition: Class of Prof. Adriana Hölszky and in Studio for Electronic Music. Lecturer at the University of Zilina and Methodical-Pedagogical Center in Presov, Slovakia: “Polyaesthetic Education in Production and Perception” (together with Prof. Michaela Schwarzbauer). 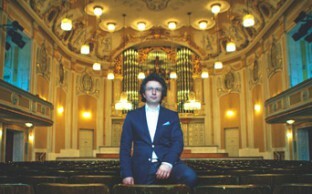 Associate of the International Society for Polyaesthetic Education in Salzburg and the Department of Music Education at Mozarteum University of Salzburg – in cooperation with European, American and Asian Universities: Development and implementation of new concepts in opera and (music) theatre. “The Concept of Polymediality and the Future of Music Education” (keynote speech). International Conference of the International Society for Polyaesthetic Education, St. Polten. “Music in the beginning of 21st century – Aesthetics and interactive approaches”. Zarya Centre for Contemporary Art, Vladivostok. “Europe’s Cultural Heritage in Ulm and Elsewhere” (Europas kulturelles Erbe in Ulm und Anderswo – Kultur als Chance für die Stadt und für Partizipation). Ulmer Reden für Europa; organised by Europe Direct Ulm, Stadt Ulm and Südwest Presse. Awakening Your Creative Soundtrack. Changing the Rules – Everything you Know is Wrong. “Autosymphonic: An Event of Unique Character”, Lectures for the City of Mannheim towards its candidacy to European Capital of Culture 2025 (together with Michel Maugé – CEO m:con mannheim:congress GmbH, Horst Hamann – staging director). “Composing a Symphony of Cars”, Lecture presented at the annual symposium “Aesthetics of the Temporary: Sketch – Design – Probe” of the interdisciplinary program “Arts & Aesthetics” (Mozarteum University of Salzburg, University of Salzburg) in Baroque Museum, Salzburg. “Improvising Polyaesthetic Auditory-Spatial Structures” (orig. “Improvisation zur polyästhetischen HörRaumGestaltung”), Lecture and workshop at the IGPE International Polyaesthesis Conference in Linz. “Sounding Scenes: Collages on Mozart” (orig. “Klingende Szenen. Collagen über Mozart”), Lecture and workshop at the International Congress of the Austrian Association of Music Teachers (AGMÖ) in Salzburg (together with Prof. Michaela Schwarzbauer). “Martial Arts: A Medial Artistic Synthesis” (orig. “Kampfkunst: Eine mediale künstlerische Synthese”), Lecture and workshop at the Summer Academy of the Austrian Research Foundation “Pro Scientia” in Styria. Composition lectures at European Institutions – at the Contemporary Opera Berlin, the Rupertinum Museum of Modern Art, Salzburg, the ARTos Cultural and Research Foundation, Nicosia, etc. Academy Member of the National Academy of Recording Arts and Sciences of the U.S.
Honorary Member of the International Art Academy, Volos. Neuratron Music Scanning and Notation Software (AudioScore, PhotoScore, NotateMe).